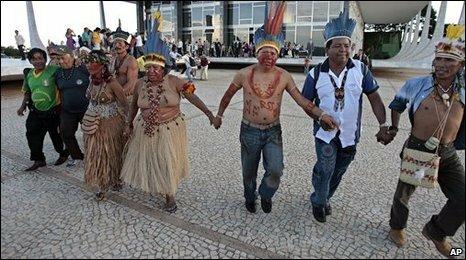 A ruling by Brazil's supreme court has boosted the efforts of the country's disadvantaged indigenous groups to keep control of their lands. By 10 votes to one, judges ruled to maintain an Indian reservation in the northern border state of Roraima as a single, continuous territory. It means that a small group of outside rice farmers with plantations in the area will now have to leave. The head of the court also accused the government of failing the Indians. This was the third occasion the court had met to reach a decision on the question, and the delays appeared to be just another indication of the sensitivity involved, the BBC's Gary Duffy reports from Brazil. The Raposa Serra do Sol reservation, which stretches more than 1.7m hectares (4.2m acres) along the Venezuelan border, is home to up to 20,000 Amazonian Indians. Indigenous leaders had feared a ruling against them would have signalled to land-owners and loggers that it was acceptable to invade their territory. Thursday's decision confirmed a decree issued by Brazil's President, Luiz Inacio Lula da Silva, who established Raposa Serra do Sol in 2005 exclusively as an area for use by the local Indian population. Gilmar Mendes, president of the court, said the ruling should set a precedent for Indian land rights. "We've established a statute that has to be applied not only in the Raposa Serra do Sol case, but also in other cases of demarcation," he said. Mr Mendes also criticised what he called the neglect of the indigenous community by the government. He said that beyond setting out the territory where they lived, the Indian population had been left to their own luck. "It is a complete neglect of public responsibility," he added. Our correspondent notes that the case has raised fears in military circles that it would create an effectively autonomous Indian reservation running along a lengthy section of Brazil's border. To meet those concerns, the court imposed a series of conditions that guarantee access by the police and military to the territory. The land dispute has turned violent on occasion with several Indians shot and injured in May of last year. "There is no peaceful solution," Nelson Itikawa, president of the Roraima Rice Growers Association, told the Brazilian government news service. "It's possible there will be a conflict - there are people who will lose control." To add to a complicated dispute, our correspondent reports, one indigenous group in the reservation supports the farmers. Police in the Roraima city of Boa Vista said the situation was calm. "There have been no demonstrations for or against the reservation, and nothing has happened to justify beefing up security near the reservation," said police spokesman Jose Negreiros.